It looks fabulous! I hope it makes it across the pond. Let's hope so. Living close to London has it's advantages--it's nice to be able to say, "I went to a West End play last night." 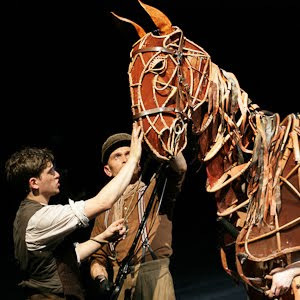 War Horse was the first book my daughter read that she found 'un-put-downable' so she was thrilled when a friend of hers invited her to see it with her for a birthday treat (11 year old girls). I have yet to see it but they and the other girl's mother raved about it! Glad you enjoyed it, the costumes alone look amazing.